Minneapolis’ U.S Bank Stadium could be a sea of green on Sunday as StubHub reports that Philadelphia Eagles fans are leading the way in Super Bowl LII ticket purchases. The secondary tickets platform said fans from Pennsylvania, the home state of the Eagles, have bought 61 per cent more tickets than people from Minnesota itself. With just two days to go before the all-important NFL American football championship game, StubHub said Pennsylvania represents 23 per cent more sales than Massachusetts, the home state of the Eagles’ opponents, the New England Patriots. Eagles fans in Pennsylvania, who have the chance to see their team play in the Super Bowl for the first time in 13 years, make up 13 per cent of total sales. 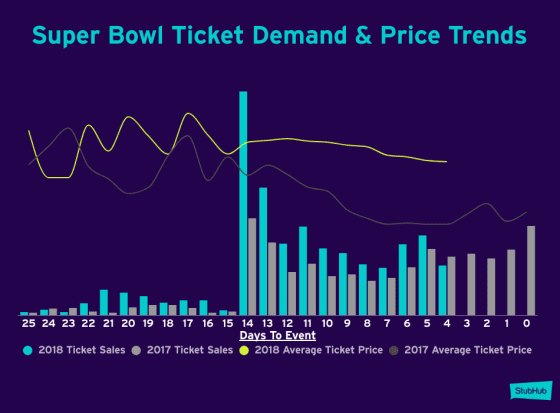 The average ticket price for this year’s big game, which will take place this Sunday at the U.S Bank Stadium in Minneapolis, has remained significantly higher than last year’s figures. The most expensive ticket sold on StubHub went for $22,000 for the Delta Sky Club, which the average price sits at $5,367, the most expensive in history, with three days to go. According to TicketIQ.com, the average asking price for a ticket to watch the NFL American football championship game last weekend was $6,942. The average asking price the weekend before the big game last year was $5,508, and $5,963 in 2016.